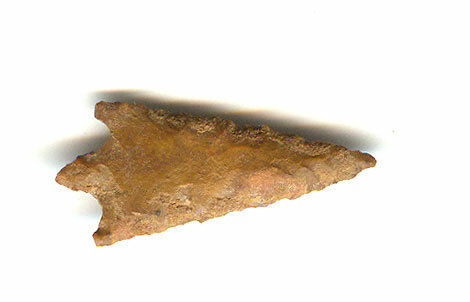 A Small Size, Visibly Aged And Anciently Use Sharpened Caddoan Bassett Arrow Point That Exhibits Surface Oxidation And Stone Aging Coloration Patination, Correct Small Pointed Basal Stem And Overall Shape, Heavy Overall Aged Surface Deposits, Correct Material And Manufacture For The Area Found. This Example Is Associated With The Red River Caddoan Mound Builder Culture, Found In Caches Of Seven Or More And In Mortuary Context. This Is A Nice Typical Type Example. Includes A Ken Partain Certificate Of Authenticity.